Today’s card is for three different challenges – the Color Throwdown 153 using Crumb Cake, Pool Party, Old Olive and White; the MOJO 202 sketch and the Splitcoast WT334 which is showing love for your Kraft or Crumb Cake card stock. There’s lots and lots of layering going on here. I’ve made a larger card today; it’s 6 1/2″ x 5″. All my pennants are cut by hand (so don’t look too close LOL). The circular piece is made by layering a circle cut with the Lacy Circle die, followed by a Small Circle die, followed by a 2″ punched circle of designer paper. The butterfly bling was colored with a Copic to match the Old Olive color. OMGoodness, this is so pretty! I recognized those CTD colors, and that Mojo sketch sent me running for the hills, but you nailed it! Very nicely done! Great card, nice colors and a pretty butterfly! Beautiful! This is one of my favorite cards of the ones I've seen using this sketch! Great job! Thanks for playing along in the Color Throwdown with us this week! Pretty! Great job with both the colors and the sketch. 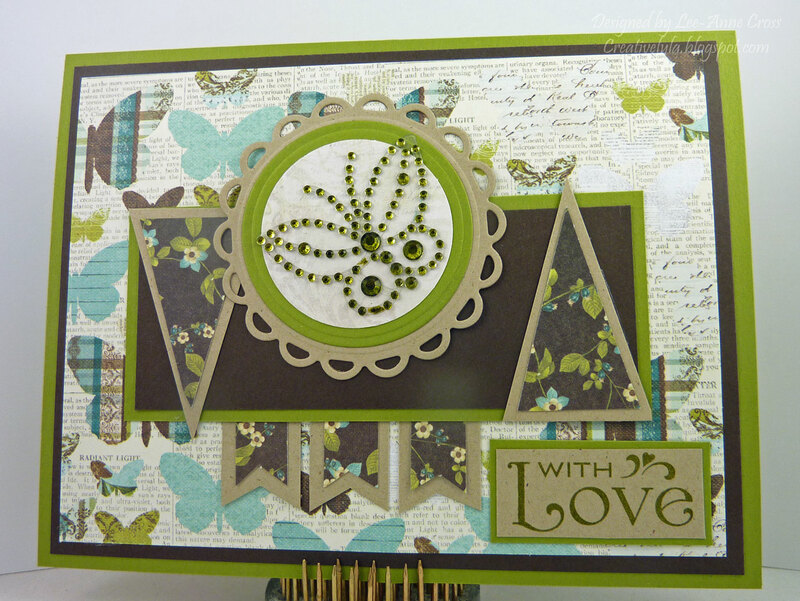 Very pretty card-such a creative combination of patters and use of the color combo!